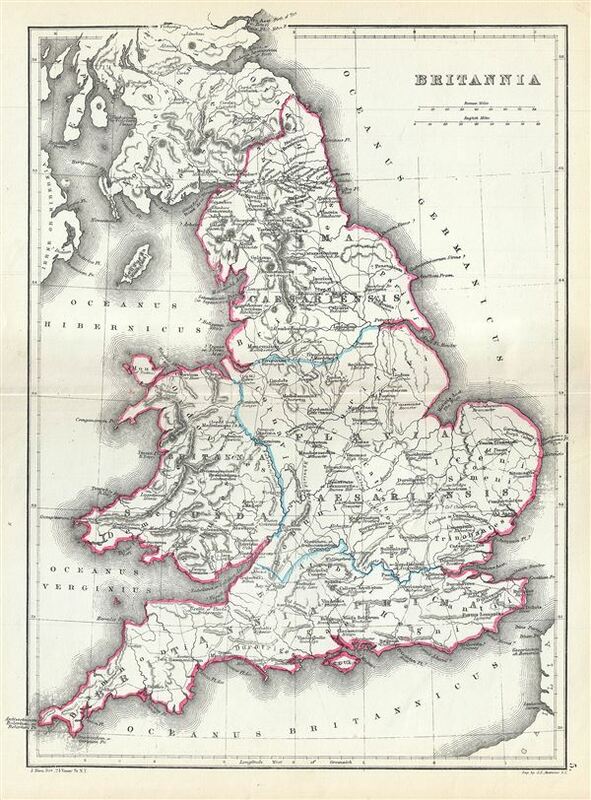 This is a scarce 1867 map of England by William Hughes. The map depicts England under Roman rule and covers all of England (Province of Britannia) as well as parts of Scotland. It features contemporary and ancient place names (Londinium for London, Corinium and Cirenchester, etc.) throughout – an invaluable resource for scholars of antiquity. It depicts Britannia divided into the four provinces of Britannia Prima, Britannia Secunda, Maxima Caesariensis and Flavia Caesariensis. The map also identifies the Wall of Antonine in modern day Scotland, and the Wall of Hadrian, fortifications built by the Roman Empire to defend against the unruly tribes to the north. This map was created by William Hughes, printed by J. Bien and engraved by G.E. Sherman, for issued as plate 5 in Sheldon and Company's An Atlas of Classical Geography.